Outside the temperatures are falling. It’s time for hearty foods, and there’s nothing like the aroma of boneless short ribs bubbling in a delicious sauce to stir up the appetite. A comfort food that satisfies. 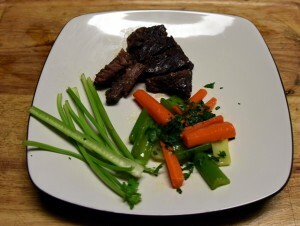 The flavors from the following recipe elevate the short rib to a higher level in the culinary world of comfort foods. A delicious variation of a classic recipe. You won’t be able to put your fork down. Here is the recipe for Braised Boneless Short Ribs Pot Roast inspired by a recipe from Chef John Walsh of The Classic Catering People. Preheat oven to 350 degrees. Season the meat with salt and pepper. Place a deep, heavy roasting pan or casserole on top of stove. Add oil and when it is hot, add meat, fat side down; sear it. Then turn meat and brown on all sides. Remove meat from pan and set aside. Add the garlic, chopped onion and carrot to the pan and cook for 1 minute. Sprinkle with flour, cook for 1 minute longer, stirring constantly. 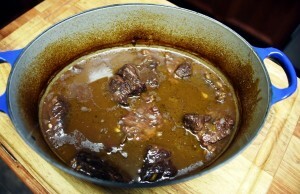 Gradually add the water, veal stock and the wine, allowing the sauce to thicken. Bring to a boil and add the thyme and bay leaves. Return the meat to the pan, season lightly with salt and pepper and place in the oven, covered. Braised covered for two hours, turning the meat every 30 minutes. The sauce should bubble gently. Lower the heat if it cooks too fast. If the sauce becomes too thick add water. Remove meat from the sauce and slice it into 1/2-inch thick slices. Skim sauce of any excess fat, season with salt and pepper. Remove bay leaves. Poach the carrots, celery root and ribs of celery in butter (I add a little water so it does not separate) for a few minutes until tender. Remove and keep in a warm place. For the home cook, the general rule is one pound boneless spare ribs for each person served. Beef; not just for dinner. Some edible by-products include margarine, gelatin and marshmallows. Non-edible by-products include leather, soap, cosmetics, crayons and buttons. By-Products from Bone, Horn, Hooves, and Gelatin: combs, gelatin candy (Gummy Bears), photographic film, steel ball bearings, fine bone china, pet food, and vitamin capsules/gel coatings. By-Products from Hide and Hair: insulation, paintbrushes, glue for bookmaking and band-aides, clothes, shoes, luggage, saddles, furniture, automobiles, volleyballs, basketballs, and baseball gloves.